Krishak Mukti Sangram Samiti (KMSS) leader Akhil Gogoi has alleged ‘Jatiya Nayak’ Sarbananda Sonowal-led Assam Government is being run from Delhi and Nagpur. 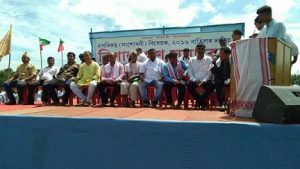 The mass rally, joined by more than 20 organizations, was held at Amguri Aauniatia Hem Chandra Dev HS School playground in Sivasagar recently. The public meeting was chaired by Dibyajyoti Das, president, Asom Jatiyatabadi Yuva Chatra Parishad (AJYCP), Sivasagar District Committee while KMSS leader Lochan Shyam Gohain explained the objective. The dignitaries who attended the meeting included Angkuran Phukan of Ahom Sena, Hemanta Changmai of Tai Ahom Yuva Parishad, Mohendra Dihingia of Ahom Jatiya Gana Mancha, Dhirendra Chetia of KMSS, Palash Changmai of AJYCP, Minirul Islam Borah of Ujani Asom Muslim Kalyan Parishad, Prabin Das of Scheduled Caste Students’ Union, Nitul Borgohain of AATASU, Dhaijya Konwar of KMSS, Muruli Tanti of Chatra Mukti Sangram Samiti. All the speakers strongly protested against the Citizenship(Amendment) Bill. At the same way, the speakers also expressed strong resentment at the eviction notice served against the Kaziranga National Orchid Park. 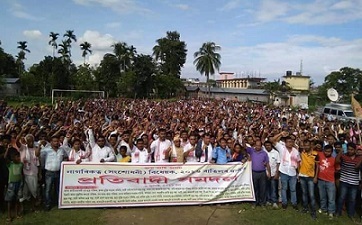 The leaders representative various organisations said, “If necessary, the people of Assam will collect money door-to-door for purchase of the said land where the orchid park. The meeting was anchored by Dulal Kalita. Later, a protest rally was also taken out throughout the Amguri town by shouting slogans.